A cake that unites the whole family and a firm favourite in our household. This cake is light, moist and really simple to make with a deliciously decadent texture. Great for any occasion but especially perfect at Christmas and for those who are not fans of Christmas cake. Cake for me is always a bit of a blood sugar nightmare. What with the grains, butter, sugar and any other sweet additions, it is just not worth the insulin fight followed by the blood sugar roller coaster I end up having to put my body through. By making cakes myself that are free from dairy, gluten, grains and refined sugar I can be safe in the knowledge of what I am putting in to my body. I like to add 4 heaped teaspoons of ground ginger, to add real warmth to the cake but if you think this is too much or even not enough then you can adapt accordingly. For the frosting it’s important to have put a can of coconut milk in the fridge for at least 12 hours before using it. This will ensure that you can scoop out all the coconut cream from the tin, which when combined with some fresh ginger (or ground) and honey, makes for the most taste bud pleasing ginger cream! 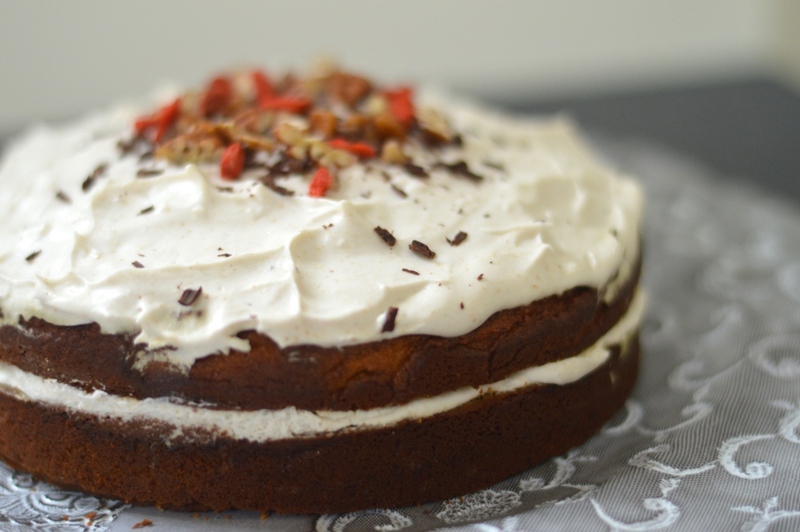 I decorate the cake with raw chocolate, cacao nibs, goji berries and chopped walnuts. A deliciously warming ginger cake, perfect for any occasion. Free from any grains, gluten, dairy or refined sugars. In to a greased cake tin spoon in cake mixture evenly and then bake for 20 mins at 180°c then reduce to 120°c (250°f / Gas Mark ½) for a further 20 mins until cooked through when a knife will come out clean. Place a tin of coconut milk in the fridge at least 12 hours prior to making the frosting. Do not shake. Open from the top and scoop out the cream (it should be thick). One can should make enough cream to frost the whole cake.